So you wanna get laid, guys? Here’s a Pro Tip: Forget flowers. Forget wine. Forget expensive dinners at the Top of the Mark. If you want to have her over for dinner and serve the bread with the meal, that’s a smashing idea. But, if you’re not quite up for all that cooking and making bread, just invite her over for an afternoon of tea and Scrabble (or send the kids roller skating with a babysitter). To start, you’ll need to have a large bowl (4-6 quarts), two loaf pans (I prefer glass or ceramic), and an apron. The apron is very important: it states in no uncertain terms that the wearer knows his way around a kitchen. Chefs wear aprons. (They also wear goofy hats, but don’t get carried away.) A bread knife is helpful, but not required (a serrated knife will work — even a serrated steak knife.) Start making the dough 30-40 minutes before she arrives, and let it “rest” in the bowl until you hear the doorbell. She’ll enjoy watching you knead the dough (while you chat with her about something she likes), so don’t jump ahead. 1 cup of dark rye flour (you can buy it in the baking section of most grocery stores). Pour 1/2 cup of HOT water over the mixture and blend well. Add the yeast mixture from above and mix. Stir in approximately 2 cups of flour, 1/4 cup at a time (you may need to use your hands to get it properly mixed toward the end), and then wash your hands and wait for the doorbell. Once you’ve gotten your guest something to drink, apologize for delaying the start of your Scrabble game by explaining that you need about 10 minutes to finish making bread dough, and then offer her a ring-side seat on the counter next to where you’re working. (If she doesn’t say something to the effect of “Wow! 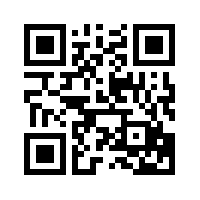 You know how make bread! ?” or “Will you marry me?” send me an email and I’ll send you a sympathy card. 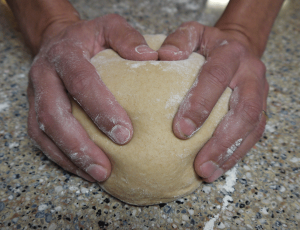 1) Placing one hand on top of the other and pressing the heel of your hands into the middle of the dough. 5) Repeating the above steps for 10-15 minutes. If she asks to help, by all means, say yes! Have her wash her hands and then stand in front of the dough. Stand behind her and put your arms around her waist. Take her hands in yours and show her how to press, fold, and turn the dough. Do NOT get frisky. You’re serious about your bread making, and even though you would love to have your way with her, you’re going to let her lead. Ahem. Of course, if at this point, she whirls around and throws her arms around your neck, to hell with the bread, you can always make more. After 15 minutes of kneading, leave the dough on the counter, wash and dry the large bowl, and then pour a teaspoon of vegetable oil in the bottom. 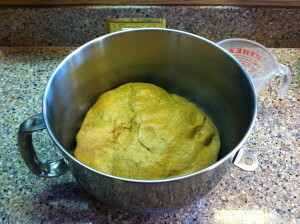 Use a paper towel to spread the oil ALL around the bowl, and then use it to “grease” the insides of two loaf pans. Place the dough in the bowl and turn it around until it’s coated with a thin layer of oil. Cover the bowl with a warm, damp cloth (a clean dish towel works nicely) and let the dough sit for 2 hours in a warm place. Once the two hours are up (or the dough is double in bulk), wash your hands, and then take the dough out of the bowl and knead it for a minute or two (until all the air bubbles are out.) Divide it into halves and form each half into a ball and then a loaf. 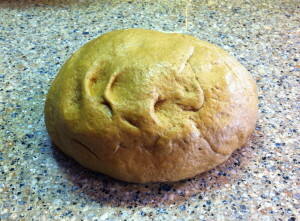 Place each loaf into a greased loaf pan (prepared above) and let the dough rise for another hour. Preheat the oven to 300 F. and when it’s hot, put the bread in and set the timer for 55 minutes. When the oven timer dings, open the door and thump the top of the bread with the back of your fingers. If the loaf sounds hollow, it’s done. If not, set the timer for five minutes and repeat the test. 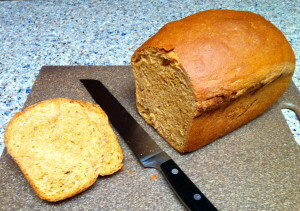 Once the bread is baked, take it out of the oven and let it cool for a couple of minutes. Try not to drool as you get out a bread knife, plates, & butter or honey. Dump the loaves out of their pans (on their sides!) onto a cutting board and let them cool for a couple more minutes. Refill your drinks, and then carefully cut a couple slices of hot (!) bread (Cook books always tell you to let the bread cool completely before cutting it, but those people seem to live in a fantasy world with infinite time and no bread thieves, so I suggest you ignore their advice). If you get a chance to try the recipe, post a comment here (or better yet, post a pic and send me a link!) to let me know how your bread turned out. And be sure to let me know how your date worked out, as well. Remember: the journey is the reward, and if you don’t get laid, at least you have something besides pop-tarts to eat for breakfast.